Our workshop management application addresses the need to implement a complete system that optimize current business processes and provide a single integrated solution that covers all the aspects of the industry. The system spans all areas of workshop management, including, but not limited to, quotations, reservations, Job orders handling, labor efficiency & productivity, final inspection, invoicing, and release notes. In addition, the solution will help you to operate business efficiently in a process controlled environment and support all employees to provide customers with high standards of customer services. Moreover, the solution is equipped with enough tools to support top management in planning and decision making to achieve short & long terms business objectives. You will utilize the solution as a reliable back end to expand globally and develop new market segments in different areas. Our solution will help you improve data entry efficiency, streamline business processes, eliminate backlogs, increase efficiency & productivity, optimize and schedule operations, optimize stock availability, optimize ROl and increase customer satisfaction. Managing and controlling all activities of Service Centers Business, providing all levels of management with the computer based information system CBIS that supports taking the right discussion in the right time. The system also provides all other levels of operation with the required subsystems, reports and analysis for the purpose of supervising, auditing and budget all types of expenses. Implementing levels of security for the purpose of monitoring all activities throughout the area of influence of the organization, and preventing the loss of company assets, ensuring the maximum utilization and best performance of these assets. In conclusion, our main purpose is maximizing your PROFIT. Proactive reservation function is the fastest, most user-friendly method for scheduling and managing service appointments. This electronic appointment function is specifically designed to bring the most critical components of your business together, your customers and your time to maximize your productivity. The system is designed to accommodate your unique needs of handling reservation. Use electronic calendar to allocate reservations considering date, operations and time schedule. A definable field is available to store information important to the requested services in which operations are not classified. Monitor appointments calendar in various views. You staff will spend less time scheduling appointments and more time focusing on customers. The system allows scheduling one-time or repeat appointments in seconds. Also allows a quick add or locate customers, find available appointment times by employee and time period. With our reservation function you can manage your appointments with speed and efficiency. Our user-friendly interface ensures all of the information you need to effectively manage your appointments is right and instantly stored. Getting started is effortless and you'll be scheduling customers’ appointments in no time. The Quotation module provides a mean of producing accurate quotations or estimates based upon data from the system. The user can enter operations and spare part quantities as needed to provide an estimation of the expected work. While building quotations the user is able to see, not only operations list, but also the current stock position. The sophistication of the underlying database system means that individual users of the quotation module may, or may not, be able to see not only the selling price of items but the also the buying price depending on their level of access permissions. Building quotations can facilitate the work with insurance companies and companies that need approvals before the work starts. The system converts quotations into job orders based on the quotations prices and conditions. This option facilitates the process of opening the job order by receptionists and confirms that the invoice values match approved quotations. From the Job Order Entry screen, the user is able to enter new jobs or convert quotations and reservations into jobs. The user also can review and modify existing jobs. The user can retrieve vehicle and customers data in seconds. For new customers and vehicle the system facilitate the data entry process within the job order screen for easier and faster handling to customers. The user can select operations and spare parts related to the requested services and provide customers with en estimate of cost and time required for delivery. Proactive Auto DMS Job Order allows the user to create splits to handle multiple types of invoicing of different operations and parts for easier and electronically handling of activities and avoid delinquent rework. Once a job is created, it would be spontaneously delivered to the loader to handle labor reservation and assignment. A spare parts request would be electronically sent to the stock control to prepare the required items for immediate delivery to technicians once requested. A graphical display of the shop load is arranged from the most heavily loaded work center to the least loaded. From loader screen, you can access the detail Load / Schedule for the workshop, with jobs grouped by Active (loaded or available to load), pending (waiting for loading) and Returned (from final inspection). The loader can view the detail for any specific day to see what jobs will be scheduled at the workshop including reservations to see the probable effect of increasing workshop capacity and/or modifying job schedules. The Loading module organizes all open operations for active job. The module automatically maintains real-time information that allows you to determine potential shop bottlenecks, prioritize operations at work centers, expedite jobs and allocate resources to optimize shop productivity. A work in progress report can be viewed, printed and forwarded to the designated person to determine the most efficient sequencing of jobs while meeting customer delivery requirements. After a job is closed, it would be automatically scheduled for final inspection, the loading module presents workshop floor activity in real-time as it occurs on monitoring screen. The labor loading graphical screen provides a snapshot of current workshop's scheduled labor load on a day-to-day basis and identifies overloaded workshops and potential bottlenecks. Before releasing the car to invoicing, an inspector will conduct a full inspection of the car and then complete a report. The report consists of some points including the status of operations completed, any required actions to be taken immediately and any further actions need to be taken to maintain the vehicle. The inspector has one of two options, either to approve the release of the vehicle for invoicing or return it to loader with remarks to complete required task. The system will automatically generate a performa invoice one the final inspection succeeded. Designated persons should review the invoice, take the customer approval, add external work charges, work out the discounts and retain taxes if applicable. Final invoice will then be created with final amount due for customer to pay. Payment of cash invoice will allow the release of the vehicle. If customers are marked for credit, the release notes could be created without payment of invoice. The release note is the final step that allows the customer to drive his/her car out of the workshop according to the payment terms. Payment terms previously set by the accounting department is the only terms that control the release of the vehicle. Release notes are automatically generated by the system and are allowed to be printed and given to customers only after payment processes are taken place. The monitoring screen displays all active jobs, the user can view real-time information concerning each job in terms of operations status, spare parts status, promised delivery date, delay reasons and many more information. The module allows users to monitor activities in all branches and remotely follow operations for effectively and efficiently manage multi-branches. The screen displays the status of each job in different colors so as to allow users to follow up jobs. Also it facilitates the LCD display to customers to monitor their vehicle movement all through delivery. Vehicle History is a very powerful tool that could be used in different areas of the business. It provides the user with all historical information about the vehicle in terms of all previous jobs done including operations, technicians worked, spare parts installed, final inspections notes and much more. Users in different levels could access the vehicle history as per needs and their privileges to get the required information. Accessing the data is simple and easy to facilitate customers handling and speed the processes of better serving them. 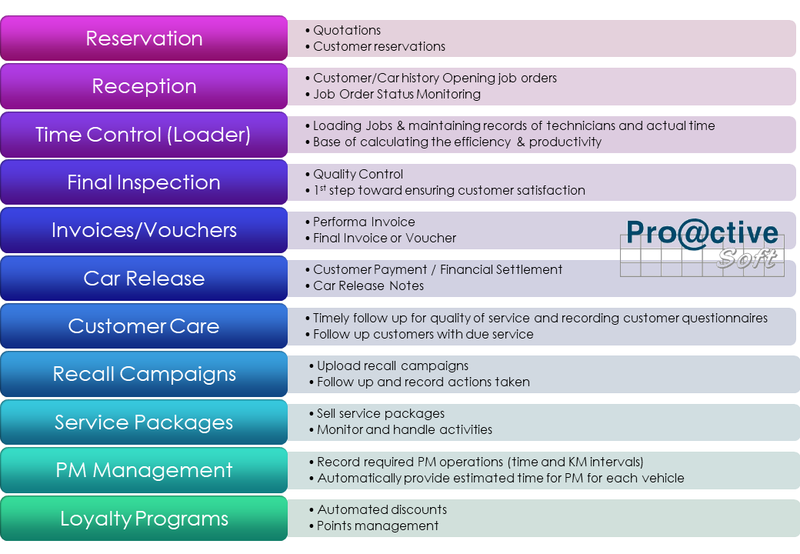 Proactive Auto DMS integrated customer care module provides the business with an integrated tool to be in closer touch with customers. Customer care module helps to maximize your customers' satisfaction with your business. It should be a prime consideration for every business - your sales and profitability depends on keeping your customers happy. Customer care is more directly important in some roles than others. For receptionists, sales staff and other employees in customer-facing roles, customer care should be a core element of their job description and training. Our system helps you to follow up work done and measure customer satisfactions with dynamic scripts that you control as per your measuring requirements. The process is automated & provides a real-time quantifying tool. Fully integrated with Proactive Stock Control management system. Fully integrated with Proactive HR management system. Fully integrated with Proactive General Ledger system. Fully integrated with Proactive Car Sales management system. Fully integrated with Proactive Car Rental management system.